Upon arrival, we were greeted with our first cocktail – a smoked peach bourbon sweet tea with Knob Creek Bourbon. The cocktail was absolutely delicious. The sweetness was not overpowering at all, and balanced perfectly with the flavour of the bourbon. Paired with this cocktail was a juicy smoked duck breast, with the sour notes provided by the orange and coriander glaze, and the side of pickled vegetables. 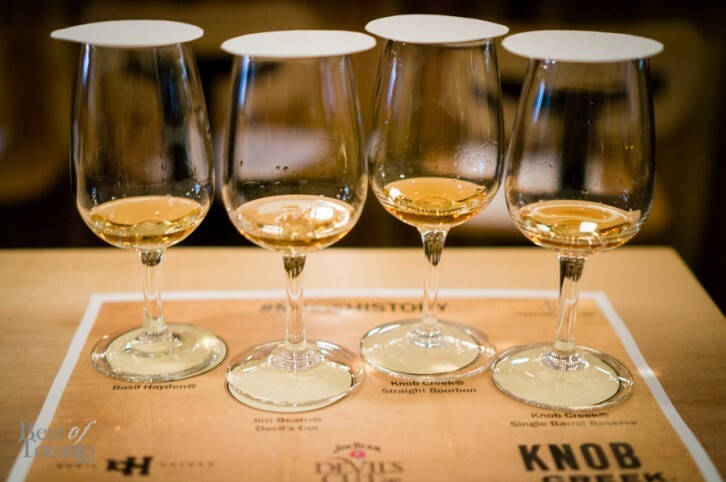 Matt Jones, whiskey ambassador for Beam Suntory Canada, then led us in the tasting of four different bourbons (top image) – the Basil Hayden, the Devil’s Cut, the Knob Creek Straight Bourbon, and the Knob Creek Single Barrel. He briefly explained the process of making bourbon and provided some interesting facts along the way. For instance, did you know that 95% of the world’s bourbon is made in Kentucky? Of the four bourbons, the Devil’s Cut had the most interesting story behind its name. 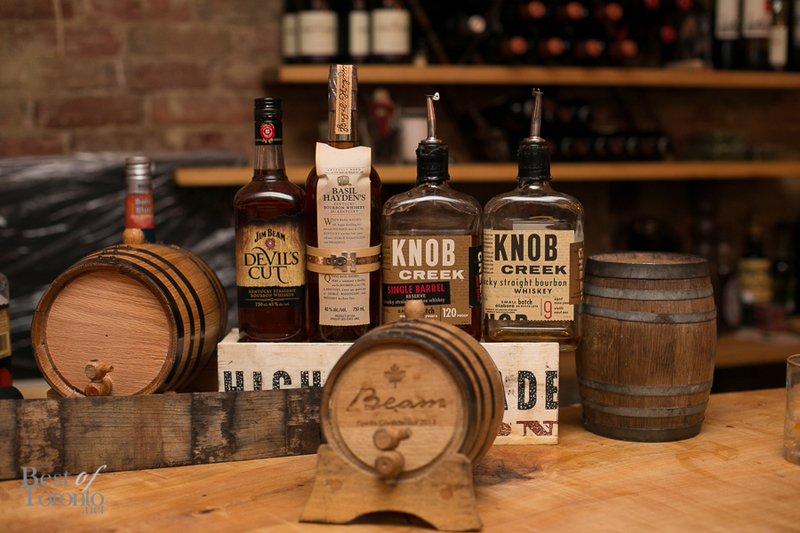 As the bourbon ages in its barrel, part of it is lost due to evaporation. This lost liquid is called the “angel’s share”. When the barrel is emptied, some whiskey is left trapped in the wood of the barrel, and this is the “devil’s cut”. This whiskey as a result has a lot of flavours of wood, oak, and vanilla. The Jim Beam Devil’s Cut bourbon is made by extracting this liquid from the barrel wood and adding it back in to Jim Beam Black Label Bourbon. After this portion of the tasting concluded, the dinner then began with smoked bacon-wrapped jalapeños stuffed with aged cheddar. The creaminess of the cheese really complemented the spiciness of the peppers and the crispness and saltiness of the bacon. Paired with this appetizer was a classic Old Fashioned cocktail made with Knob Creek Bourbon. The main course was a duo of American classics – sous vide buttermilk fried chicken and Basil Hayden mopped baby back ribs. The fried chicken was definitely one of the best I’ve ever tried – extremely tender on the inside, and beautifully crisp on the outside. The ribs were also quite delicious. The sides were a cheddar corn bread and some collard greens. With the mains, we each had the opportunity to create our own cocktails using either the Devil’s Cut or the Knob Creek Straight Bourbon. I chose the latter as it was my favourite of the four bourbons we tasted earlier in the night. For the ingredients I chose, I was inspired by the flavours of a holiday confectionary – the chocolate orange. Along with the bourbon, my cocktail consisted of vanilla-infused simple syrup, sweet vermouth, orange and chocolate bitters, and chocolate garnish. Jones walked us through each step of making our cocktails, tasting and making adjustments along the way to ensure we had the cocktail we envisioned. This was a very cool, interactive, and personal component of the night. 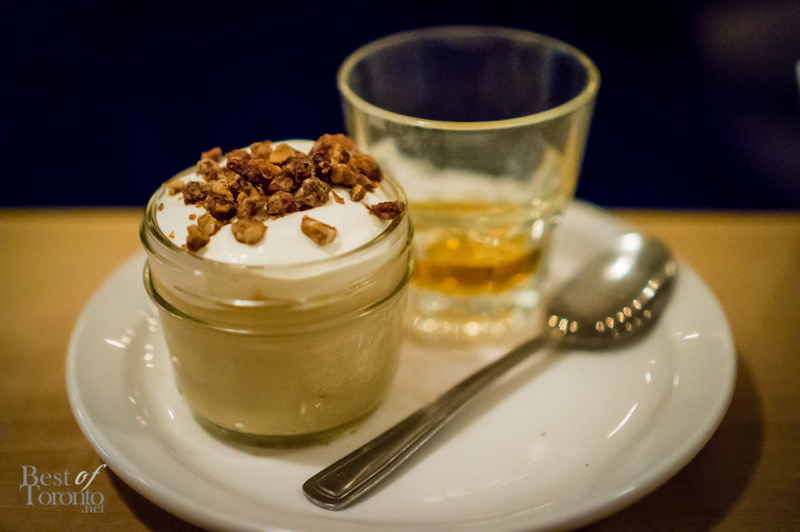 And finally came dessert – the vanilla-infused pudding topped with candied pecans. The texture of the pudding was silky smooth, in perfect contrast to the crunch of the pecans. It was a great dessert to end the night. It was paired with the Knob Creek Smoked Maple bourbon, which was also used in the dessert. The bold, smokey flavour of this bourbon worked very well with the sweetness of the pudding. We had a great time learning about bourbon, and of course, being able to sample some of the different bourbons that Jim Beam has to offer. The bourbon highlighted the dishes, and vice versa, which is exactly what a pairing should do – heighten the flavour and enjoyment of each. 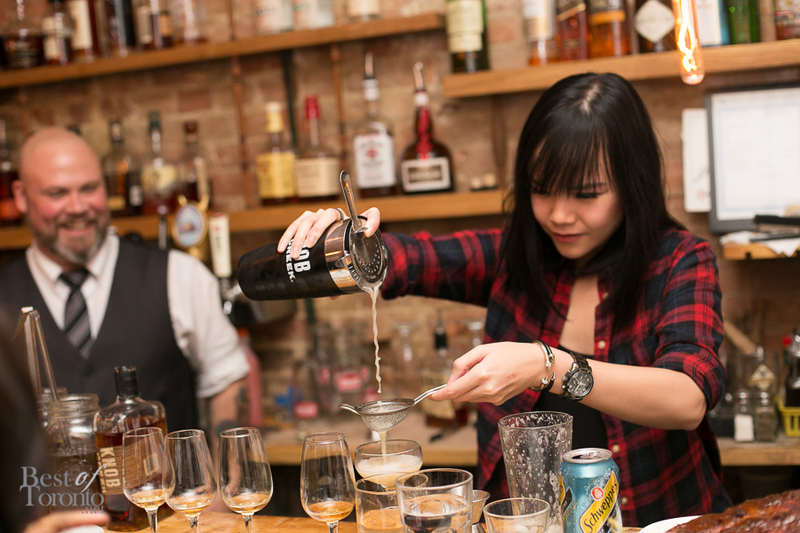 Kudos to the team from Jim Beam, Aft Kitchen & Bar, and PRAXIS PR, for an amazing collaboration.